Neat streamlined windshield you got for the cruiser! Chick, you can do a much better looking job in wood. Here is a screenshot of Charles Wittholtz,s Downeaster 18 design. 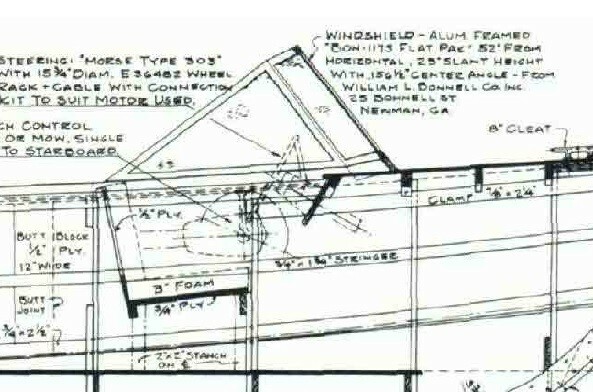 The design is for aluminum, but in the Woodenboat 'how to build' series by Graham Ero he built the windshield out of wood. Alex, plan-B is to buy a sheet of Lexan and cut and bend my own replacement plastic to fir the aluminum frame. Plan-C is to make a new wood frame to mount individual pieces of Lexan that won't need to be bent. Plan-D is to ignore the whole issue and use the boat without having ANY windshield. Where I grew up in Florida, the first thing ya did when ya got a new (New to you, but used.) boat was to remove the windshield Ya wanted the cool breeze in the face in the hot Summers. Now I gotta get back to the project at hand. Next report should be coming tomorrow late afternoon. The nice thing about a wood framed windscreen is you can hinge the panels, so you can have various amounts of air, as required. If not, these things are pretty simple to make with some precautions and a little heat. Unless ya bait him with Vienna sausage. Or corn. You know how much corn you can buy for the price of a 175hp motor (or the fuel to run it)? Nah, neither do I. I like quiet boats and foam bugs for mountain lakes. There’s a few mountain lakes around here where cats troll WITH corn. What kind of fish eats corn? Kokanee. I’m with Ken, but I’ll take streamers over foam bugs. Also, this thread title is misleading. I didn’t know this was a full sized boat. I thought it was going to be tiny. Tiger, the micro kinda grew into a mini. We started off with thoughts of a cute little thing in the 12' to 14' range with a pram bow. But then I always seem to let you guys influence me. Now we're building this monster 15+ footer. Sorry 'bout the misleading title, but it's a bit late to change now. Y'all maybe know that I'm a bit like Charlie brown. Wishy-washy. I was lying awake early this morning fretting over whether I really need or want a self bailing cockpit. After framing the transom, it came to the notice of my foggy old brain that I had developed a problem about how to fit my two 6 gallon fuel tanks. Seems like these things only become apparent in the wee small hours. With the raised cockpit sole, the tanks wouln't fit under the aft seat area ahead of the short shaft transom. They would not only sit too high for the seat, but also kinda interfere with the clamp bracket and turn screws of the motor. Maybe it would be better to drop the sole, and seat tops, back down. I still have to have some structure under the sole to support the 6mm bottom, but not much. The other consideration was to raise the seats to be able to see over the cabin. By the time I rig a comfy, cushions "captains" seat to sit in while "driving", I think I'll be high enough. As far as the self bailing part goes. I ain't aggona go if rain is forcast. And if it does rain, it's no big deal to get on plane, pull the plug, and let the water flow out where it belongs. I dunno. Guess I'll wander out to the "shop" and fool with the whole issue. Maybe even do a little mock-up like the Don is so fond of. (Don't tell him, though!) I'll let you guys know what happens. Oh, and as far as what to feed the fish, I'm not gonna fish anyway, so that discussion is irrelevant. ....HEY, who threw that dead fish at me???!!! I'm back, y'all! As promised. Gosh, I worked most all day and hardly finished anything. Too much time moving stuff outa the way, correcting mistakes, cogitating on what and how to do the next step. After much debate between my "crew", we decided to leave the self bailing cockpit. Turns out that the fuel tank solution is no big deal. But you'll have to wait and see that part. We got the aft cabin bulkhead cut out and the cleats for the side tank/seats, and the sole attached. We didn't cut the companionway yet. I wanna wait and see how the cabin interior works out. Will there be a bridge deck or not? Stowage for porta-potti or battery at aft end of the cabin?, etc. The bulkhead will be 9 inches farther aft than shown in the plan. It's called bulkhead #3 on the plan and is the center frame in the open boat version. Also got the side stiffeners cut. No big job. Except for moving everything to have room to run a 16' board through the saw. So here's the pictures. Sorry that the side with the stiffener doesn't show up very well. The stiffener is temporarily weighted in place to check the fit . Tomorrow I'll bond them both in place. So, for today, I've finished the bulkheads needed to get this puppy wired up and unfolded. You'll see the pictures of the cockpit seat face bulkheads and bulkhead #2 that supports the berth. It was originally the casting platform face, but I've lowered it to fit. Sitting in this cabin will be kinda like sitting on your sleeping bags in a tent. I've kept the berth low to allow sitting headroom. At least enough headroom to get dressed. There is enough headroom to sit on the w/c if you slouch. It will be use under the c'way hatch. The rest of the bulkheads will be made to fit as I build. I also cut holes for the "cubbys" in the aft cabin bulkhead (Also known as #3.) that will be under the forward end of the cockpit seats and accessible from the cabin. Alan is cutting me the parts to make the cockpit seat hatches for the areas accessible from the cockpit. I'm too lazy to cut my own and Mr. CnC machine does such a good job. The aft end of the seats will have blocks of foam for flotation. Gotta keep the USCG happy. I almost forgot. i glued the side panel stiffeners on that I showed ya in the last post. Tomorrow will be spent building the cradle and drilling a gazillion little-bitty holes to wire things together. The wiring is gonna be a trick as the thing is supposed to be assembled upside down. Guess I'll have to climb underneath to insert the wires. 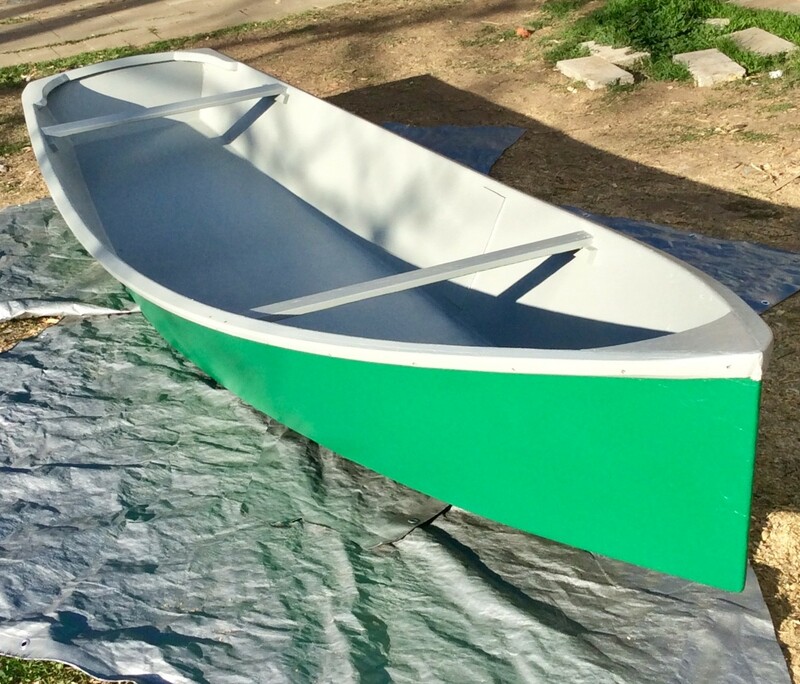 As designed, this boat was to have a 1/2 inch bottom, and the sides tacked to it. Maybe we'll get the boat. opened up tomorrow. we'll see. Hmmm "The Boat". Still no name. I'm kinda thinking about "Lost Lake" for the places we're gonna go cruising. What do y'all think? Hi Rick, good to hear from you! Are you living in Florida now? Part time? Vacation? Where? Lots of great exploring places in the Gator State. I'm being VERY careful with the fingers! Sometimes I think Chick can just about build a boat in the time it take me to lay down one fillet. Enjoying the build Chick! That’s why me and Chick is friends... Hehe. Did I mention the trimaran forming in my head? Wow Rick. Snow birds. But you're on the wrong side of the state. REAL snow birds go to the East coast. St. Pete-Clearwater-Tamper. I'll look forward to your visit! Don't forget! Amos. When ya reach my advanced age, ya gotta hurry so you'll have some time left to use the dang boat. Tiger. Like they say. "Tiger, Tiger, burning bright, in the boat shop of the night...". Purty skiff! Trimaran??? Pedal car? I used to make cool little fiberglass "car hauler' trailers for a guy that restored old pedal cars. He hooked it behind one pedal car and loaded another on the trailer when he went to shows. As a display. He sold the trailers to other P.C. guys. Now I have a friend that restores pedal tractors. Now, to today's progress report. Finished the cradle. Most of the wiring-up done. Tomorrow to "fine tune" and begin filleting/taping. Gotta go to Lowe's first for some soft steel wire for stitching. I used the last of what I have. It's "rebar tie wire". I told y'all that the boat is designed to be wired-up, upside down. Seemed easier to do it right-side up in this case. It took a bit of juggling, but worked out ok. Took most all day, though. Let's look at some pictures now. Aft view of cradle. It's high enough to crawl under to tie the wires. Side view. Sorry that I couldn't get a better angle on it. After the seams are filleted and taped, I'll drag it out of the garage and get a better picture. Hmmm, kinda fuzzy, too. How are you going to see to steer? Steering wheel? Tiller steer. The main reason for the high, self bailing cockpit sole is to "sit-me-up" high enough to see over the cabin. Of coarse i could add a flying bridge on top. Then remote helm up there. It would need a proper binnacle. Unfortunately, when I say pedal car, I don’t mean one of those pedal cars we all know and love. This one rides on 700c (“10 speed”) wheels, using custom made steering arms. It’s wood framed, and has external chain drive to both rear wheels, like an old Edwardian race car. It has a custom drive based on levers rather than spinning pedals, and a skin on frame body. P.S. For the flying bridge, you can just use a whipstaff to steer. No need for all the complication. Hehe. Boat looks good, man. P.P.S. Yes, trimaran. Daughter wants to build one to sail with her softball team, and then I decided I needed to design my own. That’s normal, right? I've found I don't use wires to stitch things any more, but when I did, I found bare copper much more desirable than steel bailing wire or rebar ties. The copper is more malleable, easier to twist and takes heat much faster for removal too. 14 gauge for most everything and 12 gauge for the harder to pull in areas.